Your shutters will arrive safely packed in a number of parcels. The longer, slimmer parcels will contain the sections of the frame and the flat rectangular parcels will contain the shutter panels. A maximum of two panels will be packed together. *Single panel only orders may be delivered built up with frame in a single flat rectangle box. A metal tape measure, a crosshead screwdriver, appropriate fixings, spirit level and a small hammer. You may require a drill and steps plus a second pair of hands to assist! We do not supply screws or plugs as standard on all frames, this is due to different surfaces require differing screw types and sizes. You may need some packers for levelling your frame. 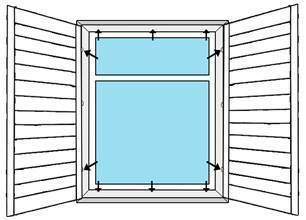 Frame – 4 sections per window. Labelled at each end. Panels –Numbered as required at the base of each panel. Hinges – Pre-fixed to both the frame and panels. - Small screws to “lock” the hinges in position. - Hinge pins to connect the two hinge sections. NB: Ensure you locate the fitting pack and store safely prior to disposing of the packaging materials. The fitting pack is usually provided in the frame boxes. Check you have all the components and create a clear workspace, large enough to lay the shutters flat on the floor. Ensure there are no sharp objects on the floor space that may damage your shutters. For ease, remove any screw cover strips from each frame section prior to assembly. The sections are labelled top, bottom, left and right. Layout the frame face down on a clean and level surface which is large enough for the full size of the shutters. Take precaution by using sheets to protect susceptible flooring from damage. Connect the mitred corners using the Hoffman key joint connectors supplied. These may require a gentle tap to ensure they are fitted correctly and fully inserted. It is important that your frame is level, both horizontally and vertically. Place the frame in the recess and use a spirit level to make sure that it is sitting perfectly straight. Use packing to level it out if needed. Mark where the screws need to go. For each of the sides use two screws, the screws should sit level with the top and bottom hinges. Three screws will be used for the top and the bottom of the frame, mark the centre first and then set the other two at equal distances. When you are ready, use a small drill bit to make the hole. 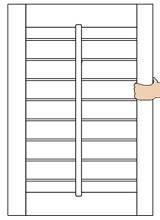 Tip – Secure the frame loosely using the two outermost top frame holes, you can then mark the remaining holes whilst having both hands free. To insert plugs where required, you will need to remove the frame once the holes have been clearly marked. Fully drill and insert plugs ready for screwing securely later. Return the frame to the window and secure the top screws only. This will allow the panels to be hung and closure checked prior to fixing all the screws. Starting with the top hinge, fix the panels to the frame by aligning the two parts of the pre-fitted hinge and dropping the pin through the centre. If your shutter has folding panels, join these together following the same process. 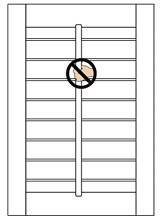 Ensure the “mouse hole” cut-out is uppermost for tilt rod operated shutters and facing into the room. 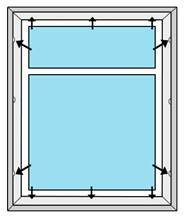 For louvre operated shutters, with no rod, there will be a rebate in the top frame section to accommodate the closed louvre. 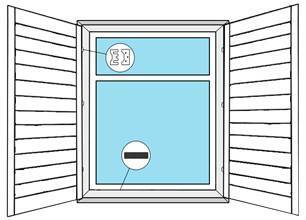 The shorter edge of the rebate should be facing into the room. NB: Check the frame is still level using your spirit level, both horizontally and vertically. Re-pack out the frame as required, open and close the panels to ensure trouble free use. If you need to align the panels (i.e. one side sits slightly higher than the other), this can be done by either inserting more packing below the frame on the lower side or by using one of the transparent plastic hinge shims, just loosen the screws holding the panel hinge in place enough to slide the shim between the hinge and the panel, then tighten the screws. You may also need to loosen the screws holding the hinges in place and reposition the hinges so that they are level. 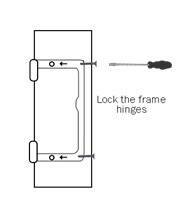 Once you are happy the hinges are level – please retighten the screws back into position. TIP: If hinged double panels do not close together flat, try loosening the hinge screws by a quarter turn to release tension. It is normal for the shutter to rest on the bottom frame, please do not try to adjust them further. 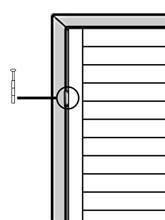 • Once all level and the panels are closing correctly you can fully secure the frame using the holes marked previously. Ensure all screws are fully tightened. • Re-fit any screw cover strips previously removed. • Screw home the centre hinge locking screws supplied. • Insert screws caps into panel side frames where supplied. • You can seal any gaps between the shutter frames and your walls using decorators filling caulk. This can be applied to both the front and reverse of the frame as required. Wipe off any excess caulk and clean your frames. The basic principles for installing shutters to the outside of your recess are the same as those for inside recess fixing. Position your built-up frame as measured allowing for your overlap and mark the fixing holes. Continue by following steps 1 to 5 above. Don’t not use the tilt rod to open and close the actual shutter panels. Use this only to open and close the louvres. When closing panels, support the weight of the leading door, lift up slightly and place back into the frame. The shutters are designed to be closed in the upward position. For tilt rod operation, hold the rod centrally to get the best closure. For shutters ordered with no rod, use a central louvre to gently tilt. All the louvers in each frame section are connected to close in unison. You can also gently run your hand upwards on the louvers to get full closure if required. Treat your shutters as you would any piece of furniture and you will get years of use and enjoyment. Use a soft clean cloth for dusting or even the brush tool on your vacuum. DO NOT use any abrasive cleaners without testing on a hidden section first. Check fixing screws periodically to ensure they have not worked loose.